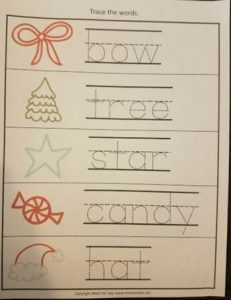 Christmas worksheets that are sure to please and excite your little learner! Disclosure: Please note that some of the links in this post are affiliate links and if you go through them to make a purchase I will earn a commission. Keep in mind that I link these companies and their products because of their quality and not because of the commission I receive from your purchases. 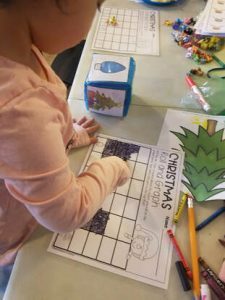 The decision is yours, and whether or not you decide to buy something is completely up to you.Is there anything better than having kids at Christmas? The excitement, the anticipation and just the pure magic that comes along with the season, are worth every single penny spent. 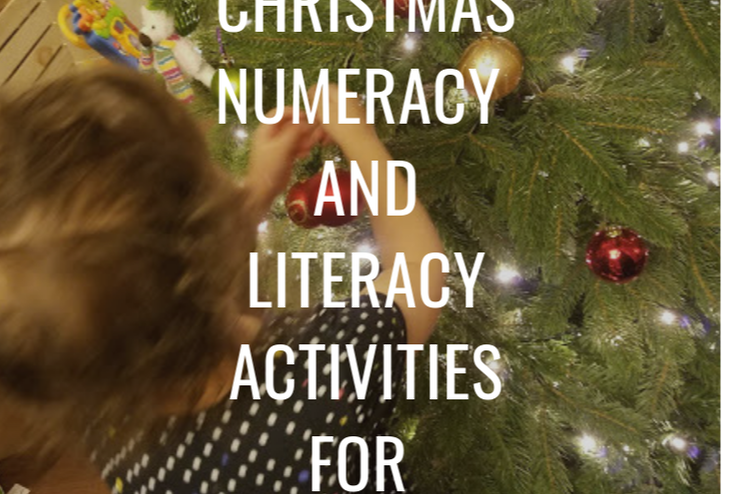 My kids were definitely in the Christmas spirit this year, and so it was only natural that we would do some Christmas activities to practice numeracy, literacy and fine motor skills! 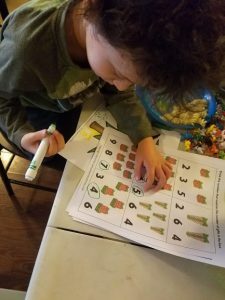 One of the things I’m most excited for in homeschooling, is being able to introduce my kids to a variety of cultures and traditions. My Undergraduate degree is in Religion and Cultural Studies and I am absolutely fascinated with how the two societal elements intertwine and create individual and national identities. I plan on sharing this curiosity with my kids, in the hopes of broadening their world view and helping them embrace and respect different cultures. 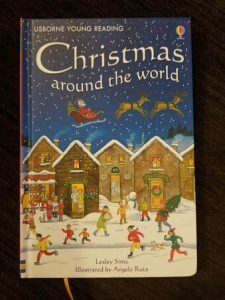 I was super excited when I picked up Christmas Around the World from Usborne Books! While it obviously explains the Christian origins and meaning behind the holiday, it also shares how Christians and non celebrate around the world. Since we are not Christian, but still embrace the cultural elements of the holiday, I actually learned a fair bit myself. One of the neatest part was the inclusion of a few different recipes including one for Christmas pudding. While I didn’t get around to it this year, I think next we will begin the tradition of stirring the Christmas pudding and making a wish. The book itself isn’t very long, but it is still broken up into chapters, which is handy for breaking up the reading to small children. We kept going back to it over the course of a couple of days, and will definitely keep it around for next year. This was a quick and easy activity. While Nathaniel finished in seconds, I am still working on one-to-one correspondence with Sophia, so she needed a bit of guidance. I didn’t bother laminating it, since I knew it would be a one and done activity, and there was no point in repeating it. This was our first time looking for differences amongst similar objects, and it took the kids a few minutes to figure out what exactly they were supposed to do. 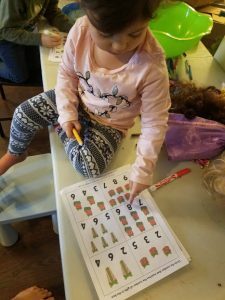 Sophia struggled with attending to only one line, which is certainly understandable given her age (something mom should’ve thought about)! So, I ended up putting a sheet of paper over the rows, so she could focus on one at a time. Once I did this, the expectation was much clearer and she soldiered through. 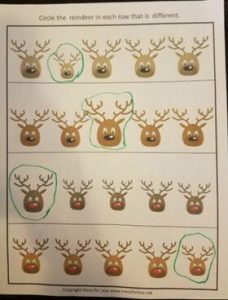 Since it was our first time finding differences, Nathaniel really enjoyed completing the reindeer sheet from Mess for Less. It was a new concept and skill to practice, so he took right to it and was asking for more! So, I quickly hopped back onto Mess for Less and pulled up this great sheet with a similar concept. It took him a moment longer to figure this one out since it was focused on directions rather than size, but he still enjoyed developing this new skill. 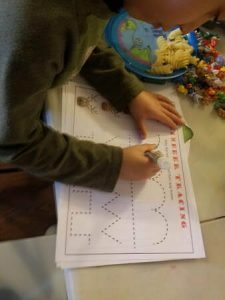 My kids absolutely love writing, but get frustrated with their level of fine motor control. 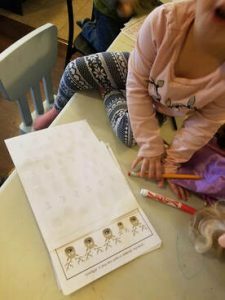 I’m always met with resistance when it comes to tracing activities, since they tend to be perfectionists, but they are so handy for helping the kids practice pen movement. 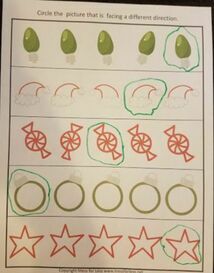 I didn’t bother tracing these as I knew the kids wouldn’t be overly enthusiastic about doing them again and they may not be suitable for their level next year. 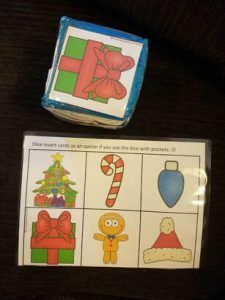 That being said, you could absolutely laminate them to let your kids practice over and over again! We do Santa at our house. I know it’s not everyone’s cup of tea and I totally get why, but the magic and fun of it are well worth the story to us. 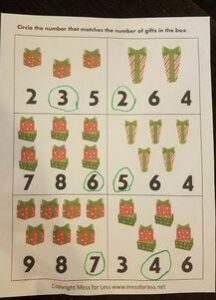 My kids absolutely ate up the Santa Dice Roll game! Not only is it Santa, but it also involved rolling dice! My kids are seriously obsessed with dice rolling! 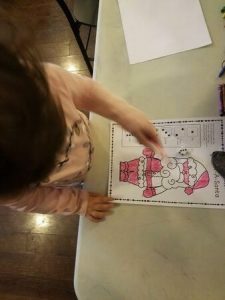 Each number corresponds to a different part of Santa, which needs to be coloured in. Sophia insisted that everything be red, but your littles could certainly change it up! As I mentioned above, my kids are all about dice! 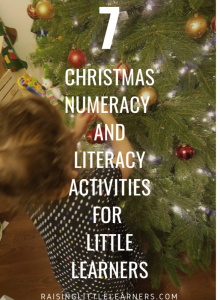 They love throwing them and recording the numbers they get, or adding them together, or subtracting them, or graphing them, or using them as a worksheet key. Seriously, anything that involves the throwing of dice, they are all over! So I was super pumped when I found this set of Differentiated Instruction Cubes on Amazon. Each face of the cube has a little pocked that you can place an image in, making your own unique die game! I pulled up a great roll and graph worksheet from, and was so pleased that I could put the faces in the cube instead of gluing them together to make a make-shift die. I laminated the sheets and the die faces, so the kids could repeat their experiment as many times as they wanted. The kids absolutely ate it up and spent a solid hour rolling their individual dice and graphing their results! Have you tried any of these activities? How did they go?